I’d ventured into making intricately formed sculptures out of solid graphite, it was really a natural evolution of my work. Necessity was definitely the mother of invention. I’d simply wanted to form something that I found to be prohibitively expensive the way pencil companies did it, - so I had to come up with another way. In 1991 when I came up with this method, it was long before technology made anything close possible. Recently, looking at using newer technology, I found it still can not do what the hand is capable of. 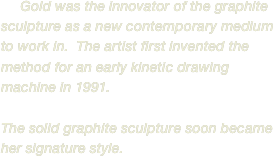 Today, 27 years later there are a few other artists who have come to appreciate graphite itself as a sculptural medium other than just a tool to draw.